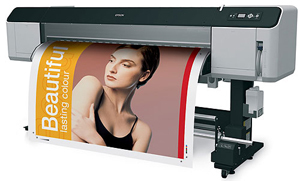 The Epson Stylus Pro GS6000 is state-of-the-art for indoor or outdoor solvent-based large format printing. Its 8-color ink system and up to 1440x1440dpi resolution guarantee rich, saturated, accurate color and virtual photographic quality at up to 64 inches wide. Materials available range from glossy poster paper to vinyl banners to backlit film for tradeshow lightboxes.